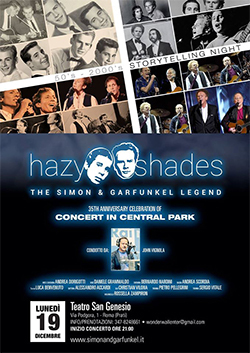 The HAZY SHADES cover the legendary “Concert in Central Park” which, on September 19, 1981 brought back together Paul Simon and Art Garfunkel after a decade of separate careers. All of the songs are played enthusiastically, using the same arrangements from the original performance. 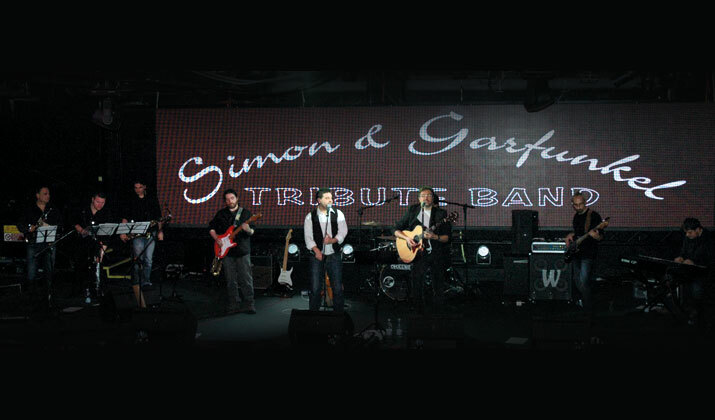 The songs however also include other Simon and Garfunkel hits which, also thanks to a brilliant brass section, render S&G Tribute Band’s concerts even more exciting. “Concert in Central Park”, one of the most important live happenings in the history of music. Just who does not love at least one song from this concert? This is the record for any Simon & Garfunkel aficionado as it beautifully encapsulates Paul Simon’s two musical periods (as a duo and a solo artist) as well as Art Garfunkel’s comeback as a vocalist. 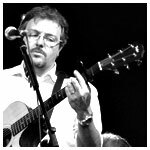 The arrangements reflect Simon’s greatly refined style: original, articulated, yet mellow and catchy. The 80’s sound gives a more modern twist to the songs without spoiling the original acoustic versions. The band was created in pursuit of reliving that magical atmosphere, by faithfully recreating songs, vocal harmonies, and even transcribing the otherwise unfindable brass arrangements. In order to further enrich their live performances, the band includes other famous songs from the “Old Friends Live On Stage” World Tour, which is still running and has had its latest dates in November 2009 in Australia and Japan.